Hatchet Job by Lewis & Aristea but interesting nevertheless! If you think the inmates have taken over the asylum in American politics, you ain't seen nuthin' yet. By now the European press has caught on to the Beppe Grillo phenomenon in Italy, the rise to power of ex-Joker Grillo and his centrally controlled Five Star Movement, which now wields the biggest plurality in Rome. Grillo peddles paranoid fantasies from the Twilight Zone,but now he has real power. Imagine Louis Farrakhan as Senate Majority Leader in Washington, DC, and you get the idea. Imposimato says Bilderbergers increase strategic tension." The presidential candidate believes there is a real shadowy conspiracy behind all of Italy's troubles: "the Bilderberg group, the Black Terror and the Masons. Now the Black Terror was an actual terrorist group in the 1970s,at the same time the Red Brigades killed and bombed in Italy. While the Reds Brigades were radical communists, the Black Terrorists were apparently neo-Nazis. That was real enough, but those people are dead or in jail. Are Masonic Lodges running Italy from some shadowy cave?Do the Bilderberg meetings, which are big and public, provide are a good place for world-controlling plotters to meet?They could use email instead. There is now plenty of evidence in the public domain that Grillo and his Guru are about as qualified for high office as Daffy Duck. Dr. Impositamo makes three. Italy dominates the Mediterranean strategically. It has 61 million people, many very highly educated. Italy also has a long, long history of extremely bitter warfare, just like the rest of Europe. The Sicilian mafia started out as a guerrilla group centuries ago. Beppe Grillo's Five Star Movement has close ties to other dubious political parties in Europe, as we have documented. A newly powerful Grillo now is in touch with the French National Front, a party with an unsavory past. Europe needs genuine reform, but it does not need conspiracy theorists running the place. Yet as we have shown, almost every shadowy new party in Europe is run by such people. Ordinary people in Europe are feeling frightened. Economic despair is spreading. Now hungry vultures are circling weakened societies over there. Americans have their own worries. But Europe has started three great world conflicts in the last 100 years. We do not need another plague breaking out in the Old World. Neither do they. The Bilderberg Group has been accused of conspiring with a far-right group to extend it's will through terrorism in Italy in the 1960's and 1970's. The story was investigated by an honorary Supreme Court judge in Italy and reported by Tyrel Ventura and Tabetha Wallace for Buzzsaw. NAPLES – “The Bilderberg Group is one of the leading organizations behind the strategy of tension, and therefore the (Operation Gladio) massacres.” This statement is not just mentioned by bloggers or conspiracy theorists, or even Beppe Grillo, but Ferdinando Imposimato, Honorary President of the Supreme Court. The former magistrate, who would be proclaimed by the ’5-Star Movement’ as one of the possible presidential candidates, speaks in Naples during the promotion of his new book. His words are very clear. “We found the truth about the massacres,” he says in an interview with a journalist. “There has been complicity between the state -or factions of the state- and the Mafia, as well as (black ops) terrorism and freemasonry. These elements came together during Operation Gladio, and consist of multiple international organizations, controlled by the CIA. This is a proven fact, “ he says. The purpose of their actions was to destabilize public order and stabilize the political power. It is important for Italians to know this, for some of their countrymen are among the members of this group and the Trilateral Commission, like of Mario Monti, the current Prime Minister, John Elkann, Chairman of Fiat Group, Pier Francesco Guarguaglini, former president of Finmeccanica or Marco Tronchetti Provera, chairman of Pirelli, also Enrico Letta, vice secretary of the Democratic Party. Interestingly, Italy has been represented at many Bilderberg Group meetings. In fact, at the last three Bilderberg Group meetings, 17 participants were Italian. On average, Italians make up 5% of the participants list at all Bilderberg Group meetings. "The Republic of the Unpunished Massacres"
"La Repubblica of the Stragi Impunite"
As a judge who was involved in very serious cases. Including the collapse banco ambrosiano / Roberto Calvi investigation and trial. Trial of the Turk who shot the Pope and so on. Since the book's release there are several YouTube videos of him in person accusing Bilderberg of Terrorism. The Basics of this are. Ferdinando Impositato, a very high ranking Italian Judge and Left Wing Politician, with an impeccable record and clean background. 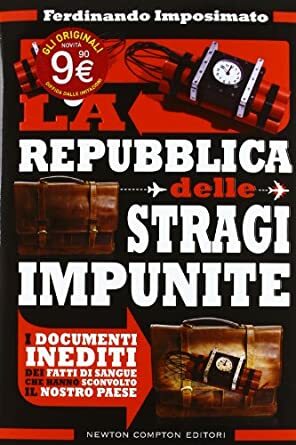 Published a book called "la Repubblica of the Stragi impunite" "The Republic of the unpunished Massacres" . Stragi, covers, massacres, slaughters, mass murder. Basically Strategy of tension covered all the Terrorist attacks of the 70's and 80's. It stands to reason that is Bilderberg is a steering committee and Policy Maker and the Policy was TENSION, then they were responsible, which embroils Bilderberg as a criminal group. The guy who he says passed him, or had the info in his files was an Italian Magistrate from Milan, he was investigating the Collapse of the Banco Ambrosiano when he was murdered. So you have the Gods Banker / Roberto Calvi dangling from Blackfriars Bridge and Licio Gelli (P2) the dude who sold the Argies the Exocets which sunk to British Warships in the Falkland Islands/Malvinas dispute. Magistrate Emilio Alessandrini, who was murdered by an alleged extreme Left Wing Group "Prima Linea " (Front Line) which were linked to Licio Gelli and the P2 Masonic Lodge. With Licio Gelli and the P2 being involved you're right into Eye of the Criminal Storm, which as we well know is running things. This story then get's very complicated, but American Freemasons are quite prominent and the "stay behind" operation Gladio is also in the frame. interfering with Italian politics and running scams. 1) Ferdinando Imposimato, born 9th April 1936, “La repubblica delle stragi impunite” he has written a few, on International Terrorism, The Vatican Crimes .. Interesting The book title translates to the "The Republic of the unpunished Massacres"
2) Emilio Alessandrini, Born 30 August 1942 Murdered in Milan 29th January 1979 The guy who originally had this information, it evidently comes from 1967, so this guy knew about Bilderberg for 12 years before he was murdered and that probably might have contributed somewhat to his early demise. His wiki page states that shortly before his death he was involved in the Ambrosiano bank investigation and ironically an investigation into connections between Left Wing terrorists and the Italian Secret Services. 3) Emilio Alessandrini was in possession of a document that states that Bilderberg was behind whole strategy of tension. He says this was to strengthen the Political Power by moving it to Center left. He states that it was a miracle that he found the document, not the religious kind, finding it was against the odds. He also states that Gladio (Clandestine stay behind operation) was going off at the same time and that it was run by the CIA, which pretty much common knowledge. 4) David Yallop mentions Emilio Alessandrini in his book "In Gods name" on pages 255, 379-381 387,409 440. It's a relevant book covers the Ambrosiano bank scandal murder of Pope John Paul I ..
Basically when you link Bilderberg to the "Strategy of Tension" you are linking them to everything that happened in Italy during that period, which was a hell of a lot. There are dozens of books that accuse the CIA of complicity in Murders and god knows what else, the Americans were undoubtedly up to their necks as they were scared Italy was going communist. Fixing Italian elections was one of the biggest post war CIA operations ever. But up until now no one has mentioned Bilderberg let alone connected them to the Strategy of Violence that was used. So the story is already written, you just have to proclaim the Bilderberg connection to it. The existence of US Army Field Manual 30-31B lends even more credibility to the accusations that the CIA tried to destabilize democratic nations to foster the U.S.' interests. The United States maintains that such a manual is a forgery and have found soviet defectors willing to testify that it was put together by the KGB. However Licio Gelli, grand master of the P2 masonic lodge involved in all of the murkiest and bloodiest Episodes of the "strategy of tension" repeated openly and bluntly (for example to now deceased BBC Timewatch director Allan Francovich) to have received his copy directly from the hands of CIA men. Imposimato is saying that Bilderberg were responsible for a whole series of events, which come under the various headings ..
1) " The Massacres / Slaughters"
3) The Years of Lead. Policy makers, CIA, Freemasons, secret services, with a load of dubious Right and Left wing Terrorist cells working in the shadows. I say dubious, because it appears that they were all under same sponsors umbrella. The case of Aldo Moro is a huge story and there has been a hellava lot of stuff written about it including by Moro's Family. This case has been linked to this CIA for years. There is also a big scandal there. involving the death by mysterious plane crash. What it boils down to is that this story is a real mega big one, made up of lot's of episodes each one is a very big story in itself. 1) the Kidnap and Murder of the Italian Prime minster. 5) Usitica, Commercial DC9 of Itavia Airlines shot down over the med sea. 6) Hundreds of Terrorist attacks, some with casualties many just a big bang in the night..
7) The Express train Italico was it, blown to bits on route.. it would take a while to compile an accurate / complete list ..